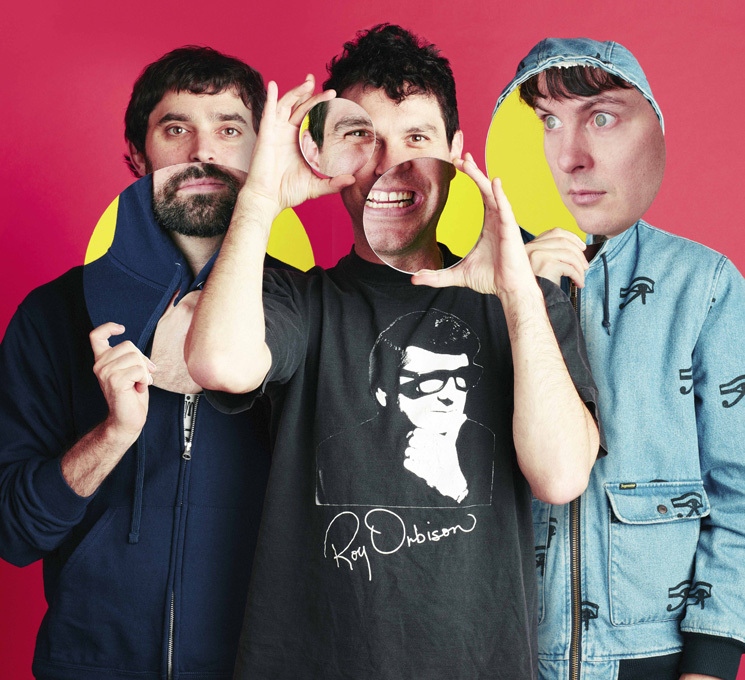 Ever since Animal Collective's beginning in the early 2000s, the Baltimore-born, New York-bred group have always seemed more like an experimental art project than a traditional band. Nowhere is this more evident than on their new album Painting With — out today (February 19) on Domino — a record that, although containing some of the band's most concise and direct songs to date, still finds the three-piece (and occasional four-piece; on-and-off again member Josh Dibb, a.k.a. Deakin, is sitting out once again) crafting the kind of otherworldly sonic collages rarely heard outside of improv and avant-garde circles. You may have heard about the band's ambitious and forward-thinking marketing campaign behind the album: working with the people at Baltimore's college radio station WTMD, the album was secretly played for 24 hours on repeat a few days before American Thanksgiving, picked up in parts of the local Baltimore-Washington International Airport (which regularly broadcasts the station over some of its speakers) and finally discussed, dissected and disseminated online through Instagram and Shazam mere hours before the final broadcast. Although the band channelled the power of modern technology to share news of the album's impending arrival, Painting With is an album steeped in simpler artistic times. As Pitchfork reported in early January, the band discussed cave paintings and cave people as inspiration before recording, and even lit candles and projected dinosaurs onto the walls of L.A.'s EastWest studios to give their sessions a particularly primitive vibe. And, although never discussed directly, more recent artistic movements aided the songwriting and recording processes as well. "I can draw a connection between the way a lot of cubists, or the style of cubism, is often a picture of a reality that's distorted and confused," Noah Lennox (a.k.a. Panda Bear) tells Exclaim! "If you take a more traditional pop song, there are a couple typical forms that might pop up as far as verses, or choruses, or bridges or whatnot. I feel like on the majority of these songs, those elements are still there, but kind of distorted, or elongated, or sometimes not present at all." Still, Painting With, for the most part, feels more like a Jackson Pollock painting than something Picasso ever did, what with its layers of colours and shapes bubbling underneath the surface of each song (bandmember Brian Weitz, a.k.a. Geologist, says some of the sounds in the songs reminded them of "paint being squirted," or concise brush strokes). But one area where the band decided to strip things away was the vocals. "The vocal arrangement is always kind of crucial to our melody, because there's not a lot of complex arrangement in terms of other instruments," says Dave Portner, a.k.a. Avey Tare. "But just the nature of the vocal arrangements on this record made it so we needed them to be clear and precise, and we thought that effecting them in any way or washing them out would kind of blur what we were trying to offer. It was really important that we take away the reverb, take away the other effects, and just have them punch and be as clear as they possibly could." One area where the lines did blur, however, was in the songwriting attribution. The vocal lines on the majority of the album are broken up, with Portner and Lennox constantly weaving in and out of each other's syllables, in turn finishing each other's words and sentences like an old married couple. "Noah and I usually do the bulk of the songwriting or set up the structures, but I think especially for this record, we wanted it to be sort of confusing as to who wrote what," Portner says. And although Portner calls the end product of visual artist (and Gang Gang Dance member) Brian DeGraw's album art for Painting With — a combination of each band member's face morphed together on one cover — a "happy accident" rather than a conscious decision to showcase the democratic approach behind the album's creation, make no mistake: this is Animal Collective at their most unified. Watch the video for lead single "FloriDada" below.